The purpose of this project was to test two lithic scatter sites along the edge of two different obsidian flows in Newberry Crater. Two sites on the edge of the Interlake Flow and the East Lake Flow were selected, and two 1-by-1-m excavation units were conducted in each site. The goal was to determine the amount and type of use for these flow-edge sites and compare the findings with information from other sites in the crater. The 12 volunteers were assisted by eight archaeologists and technicians, two geologists, and one interpretive specialist. One of the biggest concerns in this setting was telling naturally broken obsidian from culturally broken obsidian. There was a lot of obsidian there! There were so many flakes it was taking too long to pick the flakes out of the screen. I’ve never heard volunteers complain about finding too much before! About a dozen biface fragments were also located. Flake densities were estimated at 10,000—20,000 in both the second and third levels of the unit. Unfortunately, the time it took to go through all these artifacts limited the number of levels we could complete. We would like to go back and look a little deeper! At the end of the week, the volunteers had completed preliminary lithic analysis on many of the levels we had excavated. They also enjoyed presentations on the history and prehistory of Newberry Crater and vicinity, the geology of the area, and a flintknapping demonstration. 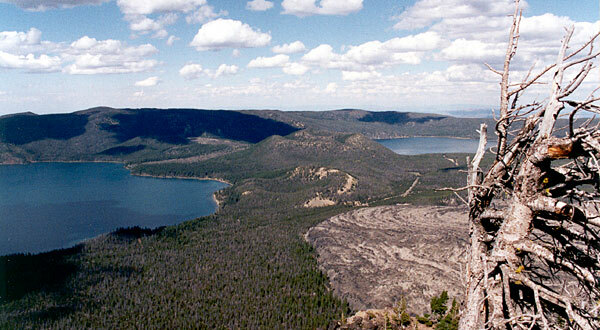 Volunteers also had time to enjoy hiking in beautiful Newberry Crater or fishing in the two lakes it contains.